In my recent quest for recipes that are both healthy and delicious I have been making a lot of poultry recipes, which is one of my favorite foods. 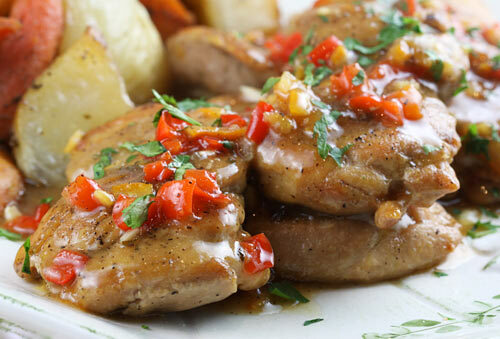 I chose chicken thighs for this recipe as they are less expensive than chicken breasts yet have a lot of flavor and remain moist when cooked, but you could use chicken breasts if you prefer. I wanted to create an orange sauce using marmalade, but was initially concerned that most marmalades contain such high quantities of sugar but I stumbled across a Smucker’s sugar free brand that had only 10 calories per tablespoon. This brand also had a fresh, clean orange flavor and I found it worked out perfectly in this recipe. I made this dish twice now, and after tweaking the ingredients just a bit, I love how it turned out and know I’ll make it many times in the future. This dish actually keeps well, and I found that even when slowly reheated the next day, the chicken stayed moist and tender. Poultry, both the white and brown meat, is a great source of low fat protein. Sugar free marmalade is used to reduce sugar content. A low sugar marmalade is used to make a zesty orange sauce for moist chicken thighs. Trim the thighs of any excess fat, and season with salt and pepper. Heat the oil in a large, heavy skillet and brown the thighs well on both sides over medium heat, about 7 to 8 minutes. Remove the thighs to a plate and cover. Cook the garlic and diced pepper in the same pan for 3 or 4 minutes. Add the chicken broth, marmalade and mustard and mix well. Bring to a boil and cook until the sauce has reduced by about 1/3 volume. Stir together the vinegar and cornstarch and whisk this into the broth mixture and cook until thickened. Reduce the heat to a simmer and return the chicken to the pan. Cook over low heat until the thighs are cooked through, about 15 minutes. Place the thighs onto a platter and spoon the sauce on top.